We hadn’t been to Monteverde cloud forest before and since the weather was pretty stormy at the farm we decided to take a few days away to explore a new area. The town near the cloud forest is Saint Elena and it reminded me of Fortuna near Arenal Volcano because of the abundance of Backpacker hotels, pizza restaurants and young travelers exploring town. We stayed at Marias cabins a sweet property run by some costa rican brothers about 2 kilometers outside of town. 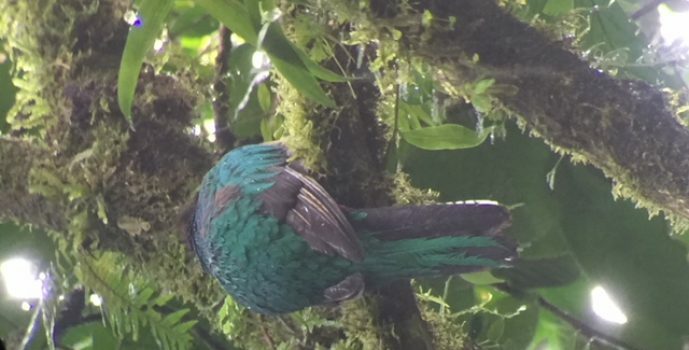 The best part of staying there was that Alexander who runs the property is also a great guide and took us into the reserve where we saw a quetzal. Not easy to spot this time of year and I’ve never seen one before so quite a score! In the afternoon a bonus trip to a lovely organic coffee farm called El Cafetel. Really lovely property much more tropical then our farm and the owners have done a great job doing educational tours. Good trip although the better time to come would be March – April for flowers and more wildlife.